Bradley Rodgers serves as Senior Scientist and President of ISI. Dr. Rogers worked professionally in the field of underwater archaeology for 31 years, and currently directs the East Carolina University Program in Maritime Studies, the largest program producer of professional archaeologists in the country (based on RPA Applications). Dr. Rodger's experience includes directing 50 major underwater archaeological projects (3 weeks in duration or longer) and has spent some 5 years living and working on site over his career. He has published or co-authored 3 books with academic presses and a dozen comprehensive book length site reports as well as a score of book chapters and peer reviewed journal articles. Dr. Rodgers's experience also includes testifying before the U.S. Congress concerning aspects of cultural resource management law. Dr. Rodgers is also senior artifact conservation scientist with ISI. His book, The Archaeologist's Manual for Conservation (Plenum, 2004) has seen widespread sales in the U.S. and continental Europe, with the latest translation in Arabic. 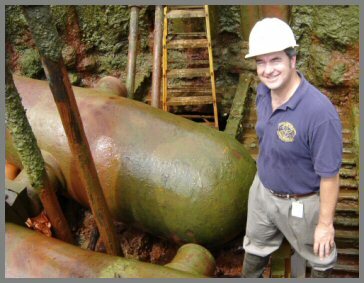 Dr. Rodgers has designed and constructed a half dozen artifact conservation laboratories around the country and consulted on major projects such as the USS Monitor and the Yorktown Shipwreck Archaeological Project.